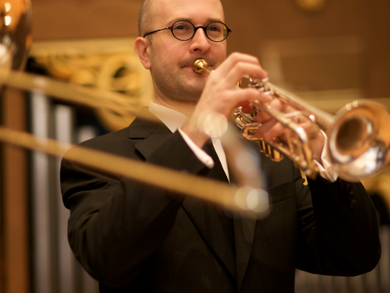 As a recitalist and chamber musician, Geoffrey Shamu’s playing has delighted audiences from summer music festivals in Vermont to the stages of Boston, Cambridge, and Paris. The sample programs listed below come from recent concerts, and can be recreated as-is or modified to suit a particular venue or presentation—such as to precede a masterclass or clinic—tailored to last anywhere from a few minutes to a full hour or more. Music of the 20th and 21st centuries. Original works for trumpet by György Ligeti, Alexandre Georges, Stanley Friedman, Eric Ewazen, with an original transcription of Joaquín Rodrigo. Unaccompanied, accompanied by piano and/or with violin (Ewazen) and guitar (Rodrigo). Trumpet (cornet) and classical guitar or piano. Transcriptions of works by Manuel de Falla, Erik Satie, and Joaquín Rodrigo, with original pieces by J.S. Bach and Toru Takemitsu. Melodious music for trumpet and piano by Georges Enesco, Halsey Stevens, Jacques Ibert and Claude Bolling, with transcriptions of songs by George Gershwin, Sergei Rachmaninoff, and Maurice Ravel. A concert of 20th-Century American music. Works for trumpet and piano by Halsey Stevens, Vincent Persichetti, Alan Hovhaness, Robert Russell Bennett, and Herbert L. Clarke, with a transcription of Aaron Copland songs. With piano, and unaccompanied (Persichetti). Featuring the celebrated concerto for trumpet by Joseph Haydn, along with a collection of Spanish folk songs by Manuel de Falla, Paths (In Memorium Witold Lutoslawski) by Toru Takemitsu, four songs from Porgy and Bess by George Gershwin, and the Sonate pour trompette chromatique et piano by Jean Hubeau. With piano, and unaccompanied (Takemitsu). A recital of melodic, 20th-Century music for trumpet and piano. Featuring works by George Enescu, Jean Françaix, Aaron Copland, George Antheil, and Maurice Ravel. With piano and English horn/oboe (Copland). Original works for trumpet by Giuseppe Torelli, Joseph Haydn, Georges Enesco, and Jeanine Rueff. Featuring solo masterpieces of the Late Renaissance/Baroque for trumpet by Girolamo Frescobaldi, Giuseppe Torelli, Giovanni Viviani, and Archangelo Corelli. Accompanied by organ or piano.